If you're anything like us, you'll dread the sight of an empty holdall. At the risk of sounding like stereotypical "fashun" types, the idea of having to condense our entire wardrobe into a single bag that could barely fit our cat is an unappealing one. A week's holiday is hard enough, so when it comes to the weekend away or staycation, the challenge can seem insurmountable. With August bank holiday coming up and many of the Who What Wear team setting off on a variety of long weekends, we thought it was time to tackle the issue head-on with our very own capsule carry-on edit. 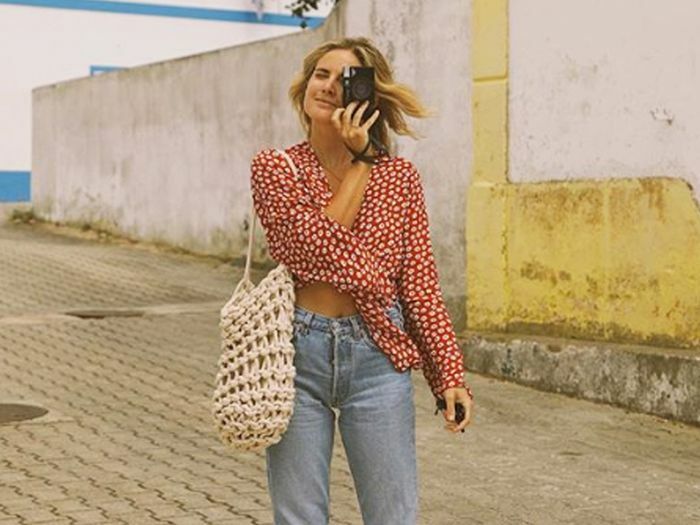 The secret to getting it right is firstly planning (sorry), secondly thinking carefully about what you'll be doing while away and thirdly bringing items that can easily be mix and matched. Easier said than done, right? To help you on your way, we've found 17 versatile, weekend away–ready pieces that we love and are available to buy now. Scroll down to shop the full edit. When it comes to packing light, you need each piece to work hard, so look for a dress that be can dressed both up and down. A shirtdress is a great option, as it'll look just as good with trainers as it will with gold jewellery and heeled boots. A pair of trainers is a must-have for traipsing around all those cultural landmarks. Veja is our favourite trainer brand for weekends away because they go nicely with dresses and skirts as well as jeans. Deciding which jacket to bring will depend on where you're going (beach or city break? Countryside or seaside town?) The Who What Wear team is, however, in general agreement that a leather jacket will cater to most requirements. Uniqlo's cotton shirts are such a staple in our wardrobes that it would seem silly not to include one in our capsule carry-on. They're comfy, easy to style and offer an instantly pulled-together finish. This Loewe bag is not only bang on trend, but it is also roomy enough to fit your entire life in (well, almost). Stuff it full of snacks for the road trip and then carry it by the handle for formal dinners. Rather than clogging up your bag with a 100 different pairs of heels, try packing these Rouje suede boots. Yes, they might not have the same spangly appeal as a pair of strappy five-inchers, however, they will work with so many more looks. Perfect for layering, a Breton top is a staycation must-have. We'll wear this H&M top with jeans, Vejas and a leather jacket while travelling. When it comes to jewellery, pick pieces that are comfortable to wear and not so statement that you can't wear them more than once. These Mango hoop earrings fit the bill nicely. Unless you're journeying to the Bahamas, it's always good to have at least one cosy jumper on hold. This Proenza Schouler knit would look so nice styled with & Other Stories' slip skirt. Whether you're braving the icy English coast or luxuriating in the South of France, a chic and practical swimsuit is a must. We love this simple yet flattering one-piece from swimwear brand Darkstar. Going out out or enjoying a fancy meal with a special someone? You'll be needing a fancy top. This is the perfect opportunity to throw a bit of print into your capsule carry-on, and this season's animal print does the job nicely. Guard against the chill of blustery beachside walks with this irresistibly soft cashmere scarf. A mid-grey is a flattering hue and will go with everything. Save on space by packing a wash bag that can double-up as a clutch. We like this A.P.C. pouch, which will fit all your beauty essentials while still looking smart enough to take out for cocktails. T-shirts in either grey or white are one of those basics that will always come in handy, whether it's as a base layer on a cold day or as a laid-back look tucked into jeans. Dune's cult Loupe slider sandals are super comfy, stylish and easy to slip on and go. No wonder they're loved by the fashion crowd. Forget skinnys—the only jeans you need in your life right now are straight leg. Darker denim is more versatile than light (it's easier to look smarter), and for a flattering fit, choose a pair that sits just above the waist. Like the shirtdress, a midi skirt will work hard in a capsule carry-on, as it can be dressed up with heels or dressed down with an oversized knit. We love the colour and floaty fit of this & Other Stories slip skirt.